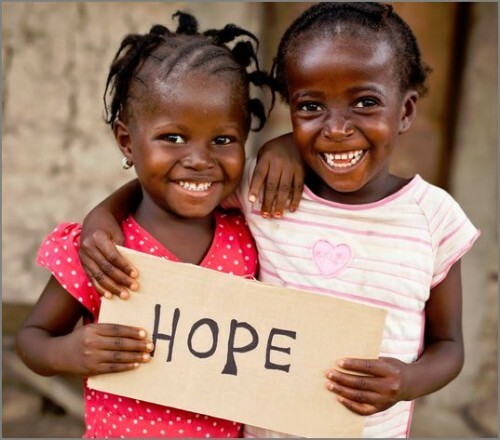 እ.ኤ.አ ማርች 2014 ከቻድ በስተደቡብ የወሰን ጠርዝ ላይ የምትገኘው የመካከለኛው አፍሪካ ሬፐብክ የዛሬ ልብ ሰባሪ አገር ሆናለች፡፡ የ2014ቷ የመካከለኛው አፍሪካ ሬፐብሊክ የ2004ቷን ቻድ ሆናለች፡፡ ባለፈው ዓመት የመካከለኛው አፍሪካ ሬፐብሊክ ህዝብ ለመናገር የሚዘገንን አስፈሪ የቅዠት መዓት ውስጥ ገብታለች፡፡ የተባበሩት መንግስታት ዋና ጸሀፊ ባንኪሙን በመካከለኛው አፍሪካ ሬፐብሊክ እየተካሄደ ባለው “የዘር-ኃይማኖታዊ የማጽዳት” ዕኩይ ድርጊት ላይ ልባቸው በሀዘን የተሰበረ መሆኑን በመግለጽ ለዓለም አቀፉ ማህበረሰብ የሚከተለውን መልዕክት አስተላልፈዋል፣ “የዓለም አቀፉ ማህበረሰብ ከ20 ዓመታት በፊት በሩዋንዳ ህዝብ ላይ የደረሰውን ዕልቂት በግዴለሽነት ከዳር ቆሞ ሲመለከት ነበር… እናም አሁን ደግሞ ለመካከለኛው አፍሪካ ሬፐብሊክ ህዝቦች ህይወት ደህንነት በቂ የሆነ ምንም ነገር ባለማድረግ በከፍተኛ አደጋ ውስጥ ወድቀን እንገኛለን… የዘር-ኃይማኖት የማጽዳት ዘመቻ እውን በመሆን ላይ ይገኛል፡፡ አናሳዎቹ የሙስሊም ማህበረሰብ አባላት አገራቸውን ጥለው በመሰደድ ላይ ናቸው፡፡ እንዲህ ያለ ድርጊት ‘በፍጹም እንደገና አይደረግም’ እያልን እራሳችንን እያታለልን መቀጠል የለብንም፡፡ ይህንን አዘናጊ አባባል ብዙ ጊዜ ደግመን ደጋግመን ብለነዋል… በማለት ሀሳባቸውን አጠቃለዋል፡፡ ከመካከለኛው አፍሪካ ሬፐብሊክ ዋና ከተማ ከባንጉይ በ150 ማይል ርቀት ላይ በምትገኘው ያሎኬ በምትባል ከተማ ከአንድ ዓመት በፊት ወደ 30 ሺ የሚገመቱ የሙስሊም ማህበረሰብ አባላት በስምንት መስጊዶች አማካይነት እምነታቸውን እያራመዱ በሰላም እና በፍቅር ይኖሩ ነበር፡፡ ሆኖም ግን እንደ ሂዩማን ራይትስ ዎች እማኝነት ከሆነ በአሁኑ ጊዜ ከ500 ያነሱ የሙስሊም ማህበረሰብ አባላት እና አንድ መስጊድ ብቻ ቀርተዋል፡፡ ከዚህ የእርስ በእርስ እልቂት አንጻር ሲታይ ለመካከለኛው አፍሪካ ሬፐብሊክ ተስፋ ሊኖራት ይችላልን? “ተስፋቢስ ለሆነችው አፍሪካ” ተስፋ ይኖር ይሆን? በአፍሪካ ተጋኖ የሚወራለት ተስፋ ይሆን? “ለአፍሪካ ተስፋ ይኖራልን?” ለሚለው ጥያቄ መልስ ለሚፈልጉ ሁሉ በአፍሪካ ወጣቶች ዓይን ውስጥ ፈልጉት፣ አእምሯቸውን መርምሩ እናም እነዚህን በተስፋ የተሞሉ ወጣቶች ከልብ አዳምጧቸው እላቸዋለሁ፡፡ ወጣቶቹ የአፍሪካ ብቸኛ ተስፋዎች ናቸው፡፡ በእነዚህ ወጣቶች ክንፎች ህልም ነው አፍሪካ በአንድ ወቅት ከጎሳ ክፍፍል፣ ከኃይማኖት ልዩነቶች እና ከቋንቋ መደነባበሮች ነጻ ሆና ልትበር የምትችለው፡፡ ስለሆነም የገጣሚ ላንግስተን ሁህ ቃላትን በመዋስ እንዲህ እላለሁ፣ “የአፍሪካ ተስፋዎች“ “ህልሞቻችሁን ጠበቅ አድርጋችሁ ያዙ፣ ህልሞች የሚሞቱ ከሆነ ህይወት ክንፏ የተሰበረች ወፍ ማለት ናት፣ በምንም ዓይነት መልኩ ልትበር አትችልም፡፡“ ወይም ለመክነፍ አትችልም! 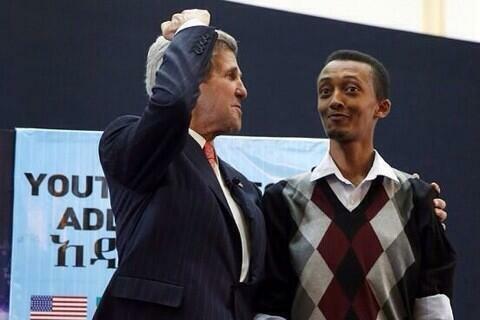 United States Secretary of State John Kerry, who is scheduled to visit Ethiopia beginning April 29, should urge Ethiopian officials to unconditionally release all activists and journalists who have been arbitrarily detained or convicted in unfair trials, Human Rights Watch said. 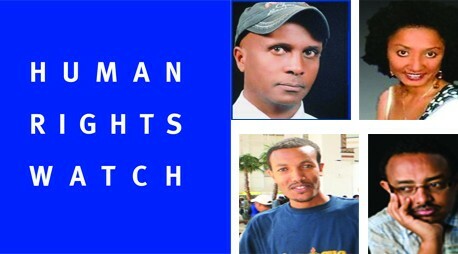 The arrests also came days before Ethiopia is scheduled to have its human rights record assessed at the United Nations Human Rights Council’s universal periodic review in Geneva on May 6. The detainees are currently being held incommunicado, Human Rights Watch said. On the morning of April 26, relatives were denied access to the detainees by Maekelawi guards, and only allowed to deposit food. Human Rights Watch released a report in October 2013 documenting serious human rights abuses, including torture and other ill-treatment, unlawful interrogation tactics, and poor detention conditions in Maekelawi against political detainees, including journalists. Detainees at Maekelawi are seldom granted access to legal counsel or their relatives during the initial investigation phase. Kerry is scheduled to meet with Prime Minister Hailemariam Desalegn and Foreign Minister Tedros Adhanom in Addis Ababa “to discuss efforts to advance peace and democracy in the region.” Kerry should strongly urge the Ethiopian government to end arbitrary arrests, release all activists and journalists unjustly detained or convicted, and promptly amend draconian laws on freedom of association and terrorism that have frequently been used to justify arbitrary arrests and political prosecutions. The Obama administration has said very little about the need for human rights reforms in Ethiopia, Human Rights Watch said. 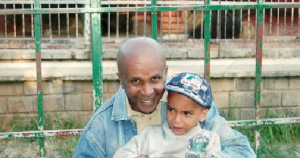 ጽዮን ግርማን እያመሰገንን፤ ወዳጆቻችን በእሁድ ቀን እንዴት ያለ ችሎት ላይ እንደቀረቡ ግራ ግብ…ት ብሎናል። በበኩሌ ዳኛዋ ሊያ ዘነበ ተባላለች፤ የሚለወን እስካነብ ድረስ እሁድ ቀን ኑ የሚል ፍርድ ቤት፤ ቤተስኪያን ዳኛውም መሪጌታ ናቸው በዬ አራዳ ጊዝዮርጊስ ቤትስኪያን ያቀረቧቸው ነበር የመሰለኝ! 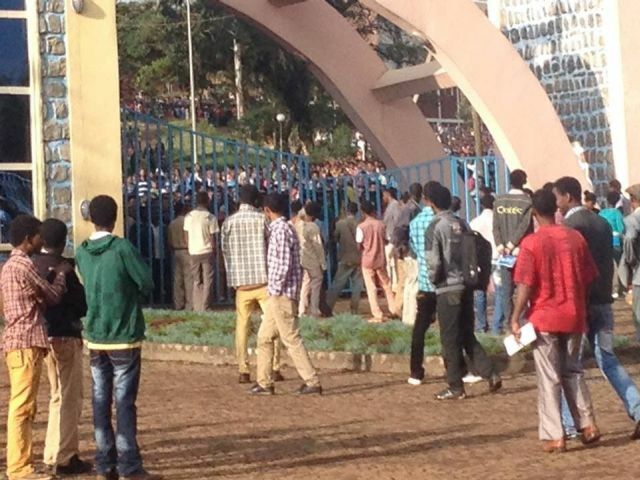 There has been widespread protest by Oromo students in universities in Ethiopia against unpopular ‘Addis Ababa-Finfinnee surrounding integrated master plan’. 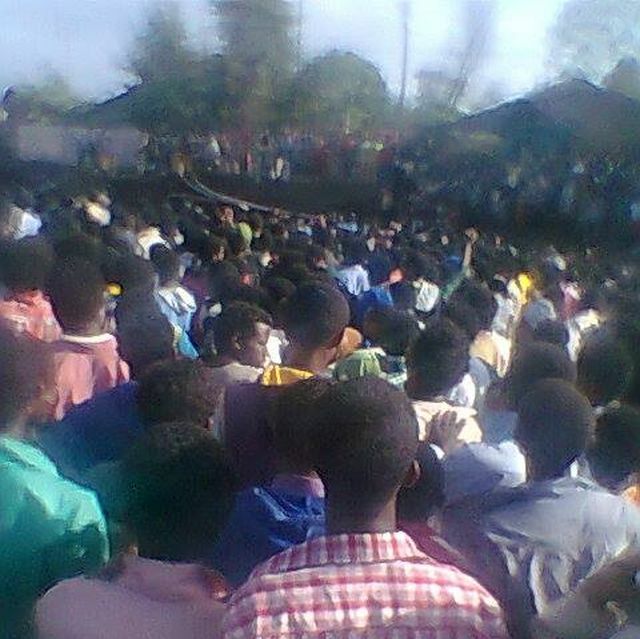 Oromo students in Haromaya, Jimma, Ambo and Wollega universities held protests. (zehabesha) Six members of Zone Nine, group of bloggers and activists are arrested today late in the afternoon at 5:20 pm by security. Team members Befeqadu Hailu, Atnaf Berahane, Mahlet Fantahun, Zelalem Kiberet, Natnael Feleke and Abel Wabela are all under custody on arrest warrant.